Even though I am a Dane and work for a Danish bank I tend to not follow the Danish media too much – after all my field of work is international economics. But I can’t completely avoid reading Danish newspapers. My greatest frustration when I read the financial section of Danish newspapers undoubtedly is the tendency to reason from different price changes – for example changes in the price of oil or changes in bond yields – without discussing the courses of the price change. The best example undoubtedly is changes in (mortgage) bond yields. Denmark has been a “safe haven” in the financial markets so when the euro crisis escalated in 2011 Danish bond yields dropped dramatically and short-term government bond yields even turned negative. That typically triggered the following type of headline in Danish newspapers: “Danish homeowners benefit from the euro crisis” or “The euro crisis is good news for the Danish economy”. 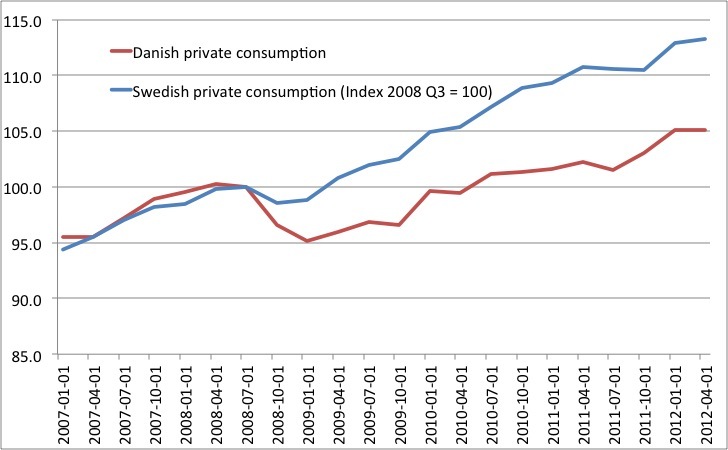 However, I doubt that any Danish homeowner felt especially happy about the euro crisis. Yes, bond yields did drop and that cut the interest rate payments for homeowners with floating rate mortgages. However, bond yields dropped for a reason – a sharp deterioration of the growth outlook in the euro zone due to the ECB’s two unwarranted interest rate hikes in 2011. 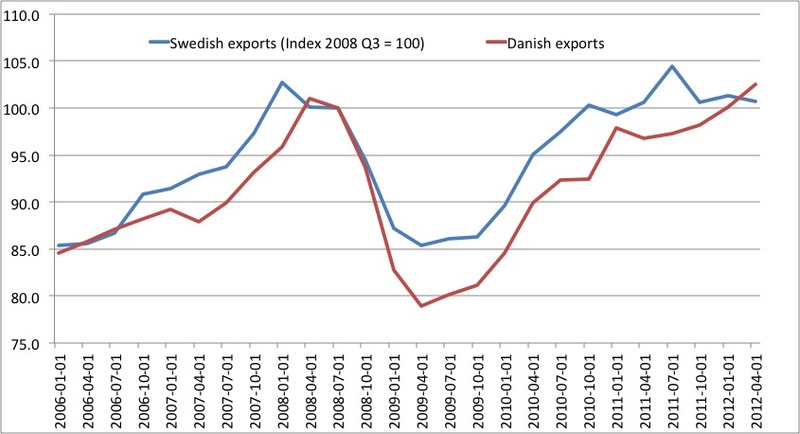 As Denmark has a pegged exchange rate to the euro Denmark “imported” the ECB’s monetary tightening and with it also the prospects for lower growth. For the homeowner that means a higher probability of becoming unemployed and a prospect of seeing his or her property value go down as the Danish economy contracted. In that environment lower bond yields are of little consolation. 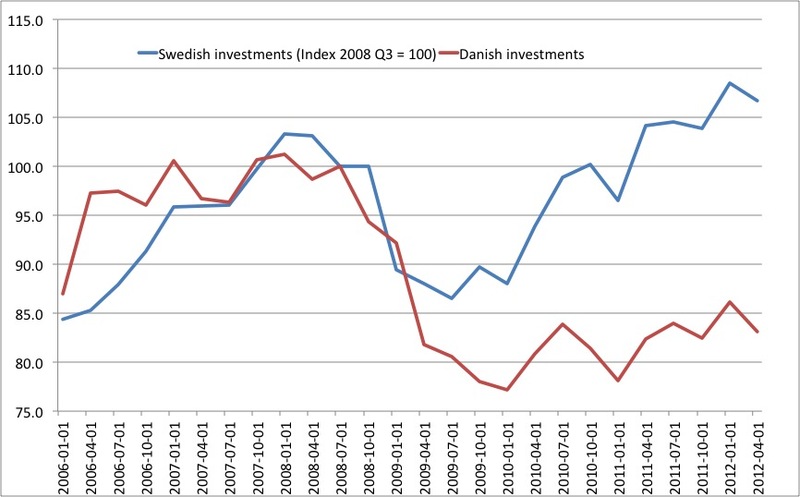 Hence, the Danish financial journalists failed to ask the crucial question why bond yields dropped. Or said in another way they failed to listen to the advice of Scott Sumner who always tells us not to reason from a price change. My suggestion is that people should never reason from a price change, but always start one step earlier—what caused the price to change. If oil prices fall because Saudi Arabia increases production, then that is bullish news. If oil prices fall because of falling AD in Europe, that might be expansionary for the US. But if oil prices are falling because the euro crisis is increasing the demand for dollars and lowering AD worldwide; confirmed by falls in commodity prices, US equity prices, and TIPS spreads, then that is bearish news. I totally agree. When we see a price change – for example oil prices or bond yields – we should ask ourselves why prices are changing if we want to know what macroeconomic impact the price change will have. It is really about figuring out whether the price change is caused by demand or supply shocks. A very good example of this general fallacy of forgetting to ask why prices are changing is the ongoing discussion of the “currency war”. From the perspective of some European policy makers – for example the French president Hollande – the Bank of Japan’s recent significant stepping up of monetary easing is bad news for the euro zone as it has led to a strengthening of the euro against most other major currencies in the world. The reasoning is that a stronger euro is hurting European “competitiveness” and hence will hurt European exports and therefore lower European growth. This of course is a complete fallacy. Even ignoring the fact that the ECB can counteract any negative impact on European aggregate demand (the Sumner critique also applies for exports) we can see that this is a fallacy. What the “currency war worriers” fail to do is to ask why the euro is strengthening. The euro is of course strengthening not because the ECB has tightened monetary policy but because the Bank of Japan and the Federal Reserve have stepped up monetary easing. With the Fed and the BoJ significantly stepping up monetary easing the growth prospects for the largest and the third largest economies in the world have greatly improved. That surely is good news for European exporters. Yes, European exporters might have seen a slight erosion of their competitiveness, but I am pretty sure that they happily will accept that if they are told that Japanese and US aggregate demand – and hence imports – will accelerate strongly. Instead of just looking at the euro rate European policy makers should consult more than one price (the euro rate) and look at other financial market prices – for example European stock prices. European stock prices have in fact increased significantly since August-September when the markets started to price in more aggressive monetary easing from the Fed and the BoJ. Or look at bond yields in the so-called PIIGS countries – they have dropped significantly. Both stock prices and bond yields in Europe hence are indicating that the outlook for the European economy is improving rather than deteriorating. A very common fallacy is to cry wolf when oil prices are rising – particularly in the US. The worst version of this fallacy is claiming that Federal Reserve monetary easing will be undermined by rising oil prices. This of course is complete rubbish. If the Fed is easing monetary policy it will increase aggregate demand/NGDP and likely also NGDP in a lot of other countries in the world that directly or indirectly is shadowing Fed policy. Hence, with global NGDP rising the demand for commodities is rising – the global AD curve is shifting to the right. That is good news for growth – not bad news. Said another way when the AD curve is shifting to the right – we are moving along the AS curve rather than moving the AS curve. That should never be a concern from a growth perspective. However, if oil prices are rising not because of the Fed or the actions of other central banks – for example because of fears of war in the Middle East then we have to be concerned from a growth perspective. This kind of thing of course is what happened in 2011 where the two major supply shocks – the Japanese tsunami and the revolutions in Northern Africa – pushed up oil prices. At the time the ECB of course committed a fallacy by reasoning from one price change – the rise in European HICP inflation. The ECB unfortunately concluded that monetary policy was too easy as HICP inflation increased. Had the ECB instead asked why inflation was increasing then we would likely have avoided the rate hikes – and hence the escalation of the euro crisis. The AD curve (which the ECB effectively controls) had not shifted to the right in the euro area. Instead it was the AS curve that had shifted to the left. The ECB’s failure to ask why prices were rising nearly caused the collapse of the euro. Traditional monetarists saw the money supply as the best and most reliable indicator of the development in prices (P) and nominal spending (PY). Market Monetarists do not disagree that there is a crucial link between money and prices/nominal spending. However, traditional monetarists tend(ed) to always see the quantity of money as being determined by the supply of money and often disregarded changes in the demand for money. That made perfectly good sense for example in the 1970s where the easy monetary policies were the main driver of the money supply in most industrialized countries, but that was not the case during the Great Moderation, where the money supply became “endogenous” due to a rule-based monetary policies or during the Great Recession where money demand spiked in particularly the US. Hence, where traditional monetarists often fail – Allan Meltzer is probably the best example today – is that they forget to ask why the quantity of money is changing. Yes, the US money base exploded in 2008 – something that worried Meltzer a great deal – but so did the demand for base money. In fact the supply of base money failed to increase enough to counteract the explosion in demand for US money base, which effectively was a massive tightening of US monetary conditions. So while Market Monetarists like myself certainly think money is extremely important we are skeptical about using the money supply as a singular indicator of the stance of monetary policy. Therefore, if we analyse money supply data we should constantly ask ourselves why the money supply is changing – is it really the supply of money increasing or is it the demand for money that is increasing? The best way to do that is to look at market data. If market expectations for inflation are going up, stock markets are rallying, the yield curve is steepening and global commodity prices are increasing then it is pretty reasonable to assume global monetary conditions are getting easier – whether or not the money supply is increasing or decreasing. Finally I should say that my friends Bob Hetzel and David Laidler would object to this characterization of traditional monetarism. They would say that of course one should look at the balance between money demand and money supply to assess whether monetary conditions are easy or tight. And I would agree – traditional monetarists knew that very well, however, I would also argue that even Milton Friedman from time to time forgot it and became overly focused on money supply growth. And finally I happily will admit committing that fallacy very often and I still remain committed to studying money supply data – after all being a Market Monetarist means that you still are 95% old-school traditional monetarist at least in my book. PS maybe the root of all bad econometrics is the also forgetting to ask WHY prices change. Is the “Bernanke-Evans rule” working? Hell yes! At least in Mexico! The Mexican economy recovered fast from the shock in 2008-9 and real GDP has been growing around 5% in the last three years and now growth is getting a further boost from the Fed’s monetary easing. Just take a look at the graphs below – especially keep an eye on what have happened since September 13 when the so-called Bernanke-Evans rule effectively was announced. A traditional Keynesian interpretation of what is going on would be that Bernanke’s monetary easing is boosting US industrial production, which is leading to an increase in Mexican exports to the US. The story is obviously right, but I would suggest that it is not the most important story. Rather what is important is the monetary transmission mechanism from the US to Mexico. Here is that story. When the Fed steps up monetary easing it leads to a weakening of the dollar against all other currencies – including the Mexican peso as funds flow out of the US and into the Mexican markets. The Mexican central bank Banxico now has two options. Either the central bank de facto allows the peso to strengthen or it decides to “import” the Fed’s monetary easing by directly intervening in the currency market – buying dollars and selling pesos – or by cutting interest rates. No matter how this is done the result will be an increase in the Mexican money supply (relative to what otherwise would have happened). This in my view is what is driving the rally in the Mexican stock market and the spike in consumer and business confidence. It’s all monetary my friend. Obviously Banxico don’t have to import the monetary easing from the US, but so far have chosen to do so. This has probably been well-advised, but the Mexican economy is certainly not in need of a US scale monetary easing. 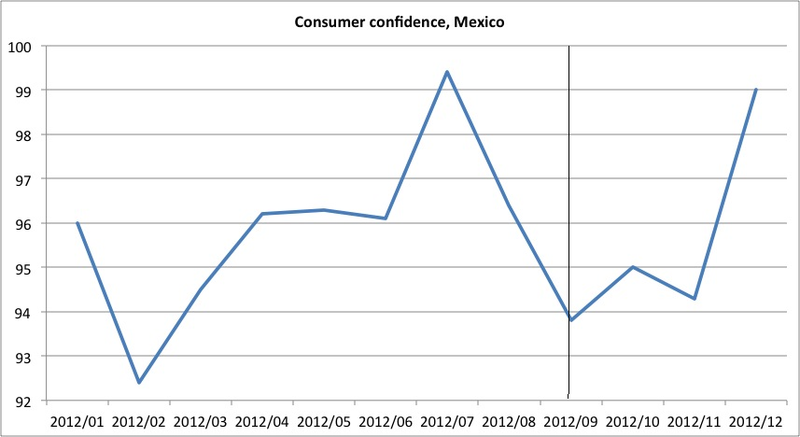 What is right for the US is not necessarily right for Mexico when it comes to monetary easing. Therefore, Banxico sooner or later have stop “importing” monetary easing from the US. Luckily the Banxico can choose to “decouple” from the US monetary easing by allowing the peso to strengthen and thereby curb the increase in the money supply and reduce potential inflationary pressures. This in fact seems to be what has been happening in recent weeks where the peso has rallied against the dollar. This is not the place to discuss what Banxico will do, but think the discussion of the US-Mex monetary transmission mechanism pretty well describe what many Emerging Markets central banks are now facing – monetary easing from the US is forcing them to choose between a stronger currency or a monetary expansion. However, unlike what Brazilian Finance Minister Mantega seems to think this is not such a terrible thing. Banxico and the Brazilian central bank and other EM central banks remain fully in charge of monetary policy themselves and if the central banks are clear about their monetary targets then the markets will do most of the lifting through the exchange rate channel. Imagine for example that the Mexican peso starts to strengthen dramatically. Then that likely will push down Mexican inflation below Banxico’s inflation target pretty fast. With inflation dropping below the inflation target the markets will start to price a counter-reaction and a stepping up of monetary easing from Banxico and that in itself will curb the strengthening of the peso. Hence, the credibility of the central bank’s target is key. And it is here that the Brazilians are facing a problem. As long as the central bank has one target things are fine. However, the Brazilian authorities often try to do more than one thing with monetary policy. Imagine the Brazilian economy is growing nicely and inflation is around the central bank’s inflation target. Then a positive monetary shock from the US will lead the Brazilian real to strengthen. That is no problem in terms of the inflation target. However, it will likely also lead the Brazilian export sector facing a competitiveness problem. Trying to “fix” this problem by easing monetary policy will on the other hand lead to excessively easy monetary policy. The Brazilian authorities have often tried to solve this “problem” by trying to curb currency inflows with different forms of currency restrictions and taxes. That has hardly been a success and luckily the Mexican authorities are much less interventionist in their attitudes. The lesson here is that the Federal Reserve is a monetary superpower and the Fed can export monetary easing to other countries, but that do not mean that the Fed is in charge of monetary policy in Brazil or Mexico. The Brazilian and Mexican central banks can also choose not to import the monetary easing by simply letting their currencies strengthen and instead focus on it’s own monetary policy targets instead of trying to solve other “problems” such as competitiveness concerns. Excessive focus on competitiveness will lead central banks to ease monetary policy too much and the result is often rising inflationary pressures and bubbles. PS don’t think that is this a zero sum – just because the Fed’s easing is working in Mexico does not mean that it is not working in the US. PPS Nick Rowe once told a similar story about Hong Kong…with another FX regime.